I’m currently working on sourcing a program that would quickly and simply engrave text with a few simple size and font options. I believe fusion is a bit much for the majority of snapmaker users and a simpler alternative would be nice for all. Thank you for the response, much appreciated. As an example, I created a number of lithophanes to print using http://3dp.rocks/lithophane/ Upu can produce a positive or negative 3D image. It would be good to engrave one of those generated images. The app generates an STL file. If you have not tried it, give it a go, it is a good app. I hope that I am making sense. Thanks, I look forward to your future postings. The software I have found that works are F-Engrave (free) and Estlcam ($60.00). Both work with the snapmaker to generate gcode, and both are very easy to understand after watching the tutorials. Estlcam will take an stl file to generate 3D carving gcode. I have yet to find any of the free CAM packages capable of doing what Doug and I discussed above. I have been able to engrave a lithophane with fusion but I will need to tweek it a bit before I’m happy. Would there be interest in a tutorial if I am successful? Yes, please, I would love to have a tutorial. The trouble with Fusion for many is it can be visually overwhelming. When you’re starting out with this stuff all of those menus and icons and drop-downs; its a lot and it can be intimidating. It’s a mega powerful program but it takes quite a while to really know your way around. Seems like an option to switch to a “novice” or similar tiered experience mode would be helpful for Fusion360 beginners. That said, Estlcam is really great - worth every penny. It’s much simpler than Fusion and has a much smaller learning curve for the kind of thing we’re trying to do with the Snapmaker. Yes, I´m doing it but as I do not have uploaded a G-Code the machine is not moving. Is this possible to move the machine as described under: “Set the Work Origin Using Snapmakerjs - chapter 5” without a G-Code? If not can I write a G-Code programm straight to the console? Im trying to start my first cnc carving but i keep getting an error message that reads “must open connection to load g-code!” any idea on what this means or how to fix my issue? Doug the newbie here. 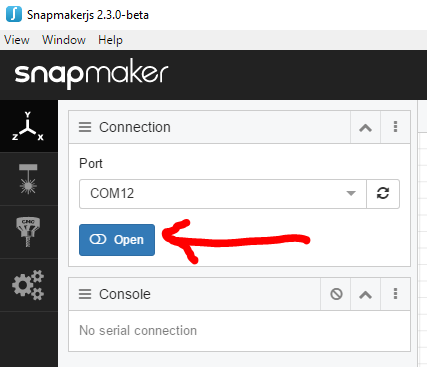 You need to have a connection between the SnapmakerJS application and the Snapmaker when connected via USB cable. The COM port will be different on your PC. Select the correct COM port and click the Open button. Thanks Doug! I appreciate your help. One can easily use vacuum to lock down a piece to be carved f it is smooth underside, then one can use the max hole plate. 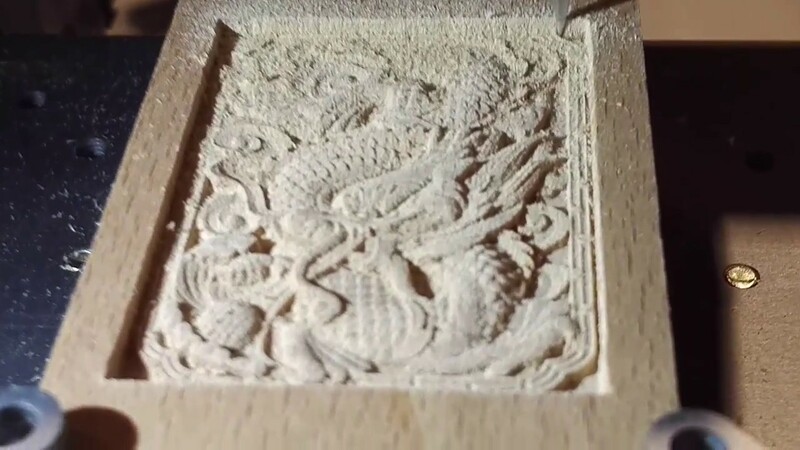 I was wondering if there is a certain thickness the material needs to be for it to carve? I know about the length and width requirements, but was not sure out thickness. It depends on how deep the G-code you’re using carves. I’d say a practical limit would be 2mm. Where are the rest of the files we can try? Yeah. You can 3D print so pieces that screw into the plate on the outermost holes. Alternatively, you just use double sided tape - working great for me so far. Recently I started going into the cnc territory, and I am having trouble with fusion 360 and getting confused with what all the options mean and do. Does anyone know of a good tutorial that goes through that kind of stuff?